Recommended knee for 100% output? For on air broadcast, can anyone specifiy the proper knee and slope to control highlights when maximum luminance will be cut off at 100IRE? I want as much dynamic range as possible, because I shoot at night, but I don't wan't my faces to become flat mud. I want my point as low as possible, with a slope that will hit at 100% instead of 108%. The X70 doesn't have a 100% option, so manually playing with slope is pointless because my EVF and LCD will always show levels beyond what makes air. Also, have found that out of the box, the X70 looses pretty much all detail at 95IRE. Also, I am woorking on a new "favorite" picture profile, using cinema 1 gamma and color modes with correction. So far, I am 10x happier with these than the REC709 PP I have been using, the colors are much more realistic, and keep in mind this is for ENG work, so it has to look good right out of the camera. Re: Recommended knee for 100% output? If you want to play with it, its color and gamma set to Cinematone1, black gamma set to low +7, and black level -1 with a +5 saturation boost. That with the color correction settings for Cinematone1 listed in my PP thread. Trying to nail down if mid or low black gamma is better for night, high is not happy with high gain, and need to get the perfect black level negative so that actual 0IRE sits at 0IRE, for direct from camera happiness. 75% Slope +1: Can anyone test this manual setting for me? So, while massaging my new X70 Cinematone 1 settings on my vectorscope/waveform monitor, I found what might be a happy perfect 100% knee level. I set manual 75%, slope +1. On the waveform, it looks really sweet, like a balloon being pressed against a flat surface. With the 75% +1 slope setting, it creates a 100% white clip via the knee. The compression starts gently at 75%, and if you open up exposure, the levels begin to flatten and stack exactly at 100% IRE. If mess with the knee value, or slope adjustment, what you get is levels moving UP or DOWN from that 100% point, and/or stacking and flattening above or below 100% IRE. Please remember that these 1" cameras pretty much loose any visible detail at around 95% IRE. It still exists a bit above that, but backing own 5IRE would double the visible details, say in some crumpled white papers well lit on a table. 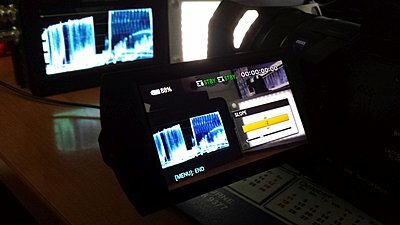 If anyone willing could perhaps put the manual 75% slope +1 settings into their cameras for testing, and let me know how you think it looks, or if you notice anything adverse about it for 100% on air broadcast use. If you want a 108% full super-white knee setting, verified on a live waveform, i can provide that, but I did not bother to find that value because the camera has no detail above 100% anyway. And please test this knee on Cinematone 1 GAMMA. The gamma does alter knee performance! Thanks for always sharing your settings Paul, it's been a huge help to me. Really wish the X70 didn't blow out so easily at 95 IRE - I shoot a lot of sunset weddings at the beach where the bride is backlit and the veil always ends up going nuclear. your 75% knee with +1 slope seems to be right on. Tested various manual knee settings in combination with slopes from -4 to +4. I found that a digit difference in slope has a significant bigger impact on highlight handling than changing the slope let's say from 75% to even 87,5%. Visually, 87,5% at 0 slope clips the highlights just a tiny bit earlier, while 75% at slope 0/+1 still maintains some detail. Works for me. Thanks again for your efforts. Glad to aid Tobias. I only felt comfortable playing with the knee settings while connected to a live waveform monitor. You wouldn't really want to do it JUST on a waveform, but it helps you ensure that what you are looking at that may look correct isn't say hard smooshing against 90IRE! If you want to see what I am talking about, just start recording, then enter the knee menu and begin making step by step adjustments while speaking out the settings on the mic. Bring the file into your NLE, turn on the waveform, and you will be able to see the difference back to back by clicking the points on your timeline. For 108% white levels, non broadcast, you can try 77.5% +4. This does exactly what I did for the 100% version, but allows brighter whites for internet or such purposes. I am testing this one myself tonight, along with a +15 black level. Hope is to be able to create a preset grade to apply to my timeline. On FCPX, I can crab the global levels puck, bring it down -8 (8IRE) and the white come down to 100%, and the blacks come down to exactly 0IRE. My only concern with 108% is loss of detail, but is it any worse that compressing 75% and up for the 100% knee? I am pretty happy so far with the 75% +1 on news scenes. It really brings down those damn fire truck reflective stripes that want to glow like the sun when you hit them with a light at night! Sorry to not jump in here earlier but have been busy editing some interview projects. I've spent almost a year now experimenting with the whole Knee thing, and have similar findings. Despite what the manual seems to say, I'm actually getting softer highlight rolloff using + values rather than - values on Slope. Then I found this older Sony document that seems to support that. It's maybe not supposed to apply to the X70, but I like what I get when treating the X70 with these guidelines. If nothing else, this document is a far better explanation of Slope/Point in the PP settings than anything else I've seen. I do not shoot for a finished look in-camera - even on casual family videos - but I'm liking my results with blacks all raised as much as possible, Point at 75, and Slope at +1 or +2. I tried +5, but that seems to get odd results. I use the Histogram and expose to maintain highlights, with the raised blacks keeping some shadow detail for me. Then in FCPX I just use the scopes as a guide to put the shadows and highlights where I want them - takes very little time and I would not even really call it "grading." I like really dark blacks, so any noise introduced by the raised blacks is totally hidden when I pull them back down in editing. The only other thing is that I am still using Rec709, as I surprisingly find that I can get flatter results from it than from Cinematone, but frankly have not tested it extensively again since I learned to use PLUS Slope values rather than MINUS. On my waveform, the faces show at 50IRE for the first cop, 60IRE for the second security guard. With the 75% knee, they start to compress if I exposed any further. Wanted opinions on how faces look with my test settings, since faces are what matters. Also, threw in a shot with an ambulance with bay lights on, VERY bright, at like 30db gain, so you can see how the 75% +1 handles non human high contrast highlights. If you want to limit your x70 to 100IRE there is one setting in the x70 that will do that. See the attached pictures. This was a quick rough and ready setup to show what you will get. These pics show an x70 looking at a direct light source. In this case it is an LED top light. 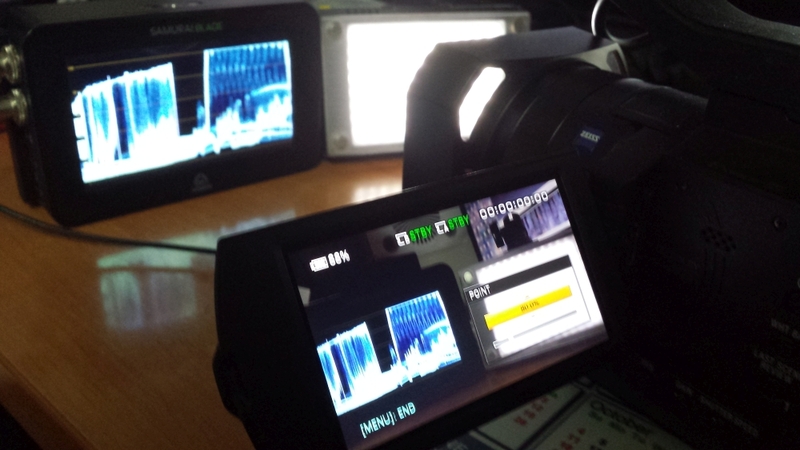 Sitting next to the LED is an Atomos Blade with the SDI straight out of the x70 being fed in. The Blade is set to full screen WFM (waveform monitor). The peak level of the light is now clamped to 100IRE with the camera over exposing the light source. You can see this displayed on the WFM. To achieve this on an x70 means your knee must be set manually at 80 and your slope at -2. View the levels on the WFM the x70 is clipping at 100IRE. This is a pretty brutal setup. Here in Oz we can deliver up to 104IRE. Anything over that can cause cross-talk between audio and vision carriers on some earlier links. You say that you are losing detail at around 95IRE. This is to be expected as peak white, not highlights, should be sitting at no more than about 90IRE. Your signal for TV is basically 0IRE for black and 90IRE for white. That represents the first 5 stops of the 6 stop dynamic range of the Rec709 display signal that 99% of TVs and displays are set up for. As you go over the 90IRE level you are starting to roll off the highlights. In other words compressing the additional highlight, reflection, glare levels that are over 90IRE to fit them into that last 6th Rec709 stop. These additional levels of exposure over 90IRE are now being heavily compressed and detail will be rolled off and the more the signal is compressed the less detail will be preserved. Rather than me labouring the point I think the best and clearest description I have seen that explains all this in a pretty easy to digest way is Alister Chapman's recent video on the Sony FS5. He talks a fair bit about what is happening to the video signal and shows examples of what is happening on his display slides. Many production people, camera and post could well learn a lot from Alister's demonstration especially if they have not been technically trained in just how the video signal works with regards to cameras, post and Rec709 displays. Check the video specifically at 01:09:15:00. Yes that is one hour nine minutes. Grab a coffee or a beer because the video is two hours thirty long with about thirty minutes devoted to the FS5. Disregarding that the rest of the video is a very good lesson in understanding many aspects of the video signal. It covers levels, gammas, curves, LOG and pretty much everything else a shooter/editor should know. Paul you may remember my original settings, which BTW we are still using for broadcast, were, knee 87.5 and slope -2. These gave us the most natural highlight roll off and kept us close to the IRE104-105 that we can get away with. Of course these knee/slope settings worked best in conjunction with the other settings I came up with. Thanks for the well thought out reply Chris! I used to run your 87.5% -2 KNEE as my default, but found that for my subject matter, AUTO knee provided better results. When stuck with that damned 108% white clip, AUTO seemed to produce more usable detail and gradients in the 100-108IRE range than the 87.5 manual. The 75% +2 I offered up for testing, does similar to what you say your 80% -2 does. What I was going for on my waveform was a white clip that stopped at 100%, and the gentlest sloping that I could see as things got up to 100%. I will throw your 80% -2 into the camera, and see how it directly compares. I am not too happy with how this "artificial" 100IRE white clip knee looks IMHO, with faces looking best at 50% on Cinema gamma. I am used to bringing faces up to almost 100IRE with very little light, and the video I posted above just looks weird to me......am I right, does it look odd?